Box-ticking is a fact of life we’re all familiar with. No matter how routine, managerial decision-making is propped-up by paperwork for those rare occasions when investigators need an audit trail to follow. It often seems disproportionate, but such is the shadow cast by our legal system. Nowhere has bureaucracy felt more onerous than in the realm of product approval, justified by the need to avert uncontrolled risk. This isn’t a recent affliction though; those in authority have been rightly asking questions since the railway’s early days. Box girders are standard design tools for today’s civil engineer and, as such, their history is rarely given much thought. The first major railway structure to employ them - straddling the Nottinghamshire-Lincolnshire border at Torksey - still stands as a notable landmark in time and space. So ground-breaking was it that the regulator initially refused to sanction its use. A vigorous technical skirmish ensued with the engineering fraternity, both sides fearing the reputational damage that being proved wrong might inflict. The result was a four-month stand-off accompanied by mud-slinging. Largely responsible for development of the box girder was Kelso-born engineer William Fairbairn, working alongside mathematician Eaton Hodgkinson. In the late 1830s, these longstanding collaborators revealed an optimal design for a riveted wrought iron plate beam which, in the context of bridge applications, incorporated cells at the top to help resist compressive forces. The north side of the viaduct, looking east. Soon after the pair’s work was published, proposals emerged for the Chester & Holyhead Railway which demanded two substantial bridges, over the River Conwy and Menai Strait. These were advanced under the stewardship of chief engineer Robert Stephenson who put forward the idea of constructing the spans as wrought iron tubes. He retained Fairbairn and Hodgkinson as consultants, asking them to consider the practicalities. In April 1845, a series of experiments began on large-scale prototypes, mostly carried out at Fairbairn’s shipyard in Millwall. Hodgkinson validated the conclusions through calculation. Opened on 5th March 1850, the Menai Strait crossing - known as Britannia Bridge - was a pioneering structure of great proportions. Its two central spans each extended for 460 feet and weighed 1,500 tons; with the side spans, these formed a continuous girder of 1,511 feet, rectangular in section and large enough to accommodate the trains within it. Until then, the longest wrought iron span had been just 31 feet 6 inches. Ultimately, Stephenson’s tubular girder bridge concept proved too costly for widespread adoption due to the volume - and hence cost - of the materials needed. But it did inspire another engineer to take things in a slightly different direction. The Manchester, Sheffield & Lincolnshire Railway established a link between Liverpool and Grimsby through the first Woodhead Tunnel. Its directors enjoyed an inaugural trip between the two ports on 16th July 1849, passing six miles west of Torksey Viaduct which their company was building as part of a line connecting Retford to Lincoln. Engineering it was John Fowler, remembered today for constructing the earliest parts of central London’s underground network and as co-designer of the Forth Bridge. 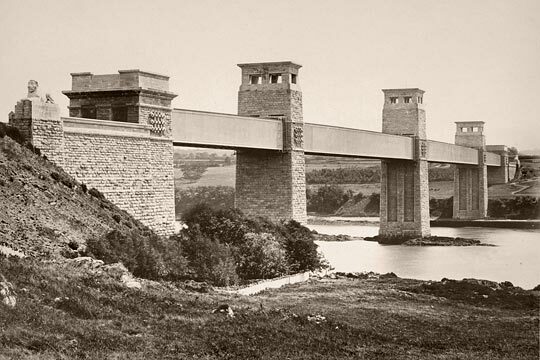 A very early photograph of Stephenson’s Britannia Bridge across the Menai Strait, taken circa 1860. 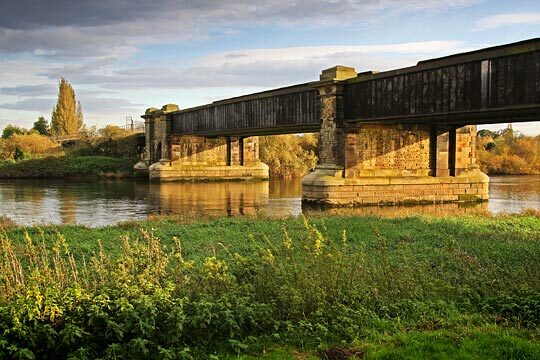 Crossing the River Trent, the viaduct featured a timber approach structure on its east side - 570 feet in length - with two 130-foot clear spans over the water supported by a central masonry pier. Each span comprised pairs of wrought iron box girders measuring 10 feet high and 2 feet 3 inches wide, with two cells at the top. The deck plates and tracks were carried on cross beams at 2-foot centres. Work on the viaduct was completed late in 1849 and Captain Lintorn Simmons of the Royal Engineers attended on 21st December to inspect it for the Board of Trade. Formal authority to open was a requirement of the Railway Regulation Act 1840 which brought into being the Railway Inspectorate. Simmons tested the girders by arranging for two locomotives and tenders to be brought onto each track above one of the spans. The deflection was measured at almost 1¼ inches. This was “more than might, I think, have been anticipated”, he remarked; the riveting “appeared not to be very perfect” and the girders themselves were “not built in a very accurate line, nor very regular in form.” Based on these observations, it was concluded that the structure presented “danger to the public using the same, by reason of the insufficiency of the works.” Approval was therefore refused until strengthening work had been undertaken. The potential consequences of design and constructional deficiencies were well understood by Simmons, having investigated the fatal collapse of a bridge over the River Dee, one of Robert Stephenson’s lesser structures on the Chester-Holyhead route. It was concluded that the main cast iron girder had been substantially weakened by repeated flexing due to traffic loading. As a consequence, it broke in two places as a train passed over. 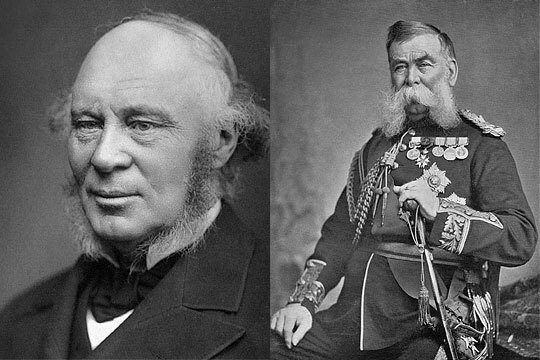 Engineer Sir John Fowler (left) and Field Marshal Lintorn Simmons, the two protagonists in the conflict over Torksey Viaduct. The accident prompted a government inquiry into the use of iron in railway structures, a substantial contributor being Eaton Hodgkinson who derived an empirical formula for establishing the concentrated load at which a cast iron beam would fail. It was also recommended that such a beam should not be subjected to a live load exceeding one-sixth of that breaking weight. For the MS&LR, the commercial implications of Simmons’ decision on Torksey Viaduct were obviously damaging. Fowler wrote to him, pointing out that he had erroneously taken the weight of the four locomotives used for testing purposes to be 80 tons when they were actually 148 tons. Simmons recalculated, asserting that “the conclusions at which I before arrived still remain unshaken.” Another trial was arranged, this time resulting in a deflection of 1.26 inches from a load of 223 tonnes (six locomotives), but Simmons would not be moved. Whilst conducted with appropriate formality, the exchange of letters between Simmons and Fowler had a distinctly prickly tone as each attempted to dismantle the other’s argument. It’s worth making the point - as Simmons readily acknowledged - that neither could claim any expertise as only Fairbairn and Hodgkinson had accrued much genuine understanding of the subject. As such, it became a little like two bald men squabbling over a comb. Eventually Fowler cut to the chase, asking Simmons to specify what further strengthening the viaduct needed. He responded that a load of 400 tons over one span - including the 164-ton weight of the structure itself - should not produce a pressure on the top plate of more than five tons per square inch. Fowler protested strongly at this as Eaton Hodgkinson had, in his view, determined that eight tons per square inch was “a perfectly safe compressive strain”. However Simmons pointed out that this was based on a girder without joints. But Fowler then pulled a rabbit from his hat, claiming that the bridge - without any alteration - already complied with “his extraordinary requirements”, as Simmons had failed to account for the girder being continuous across the two spans. This, according to Fowler, “imparted additional strength to the bridge in the proportion of 9 to 14”. Stumped, Simmons retorted that continuity had “never been urged upon me…as an important element in the consideration of the bridge”, despite “a casual reference” being made to it during one discussion. Back at the Institution, engineers Charles Wild and William Pole were independently attempting to validate Fowler’s investigations on the benefits of continuity - one through experiment, the other by calculation. They both concluded that as the bottom plate was subject to compressive forces over the central pier - but was in tension elsewhere - the girder could be regarded as three independent beams, divided at the points of contrary flexure. Using this approach, it was determined that the effective length of each span should be regarded as ~108 feet, not 130 feet. With the required load of 400 tons reduced in proportion, the greatest compressive strain on the top plate could then be calculated at ~4.6 tons per square inch, less than the limit stipulated by Simmons. It isn’t hard to imagine the frosty atmosphere when, on 26th March 1850, Fowler, Pole and Wild met Simmons and his colleague, Captain Laffan, on the viaduct to demonstrate their findings. This was done by fixing a telescope to the western abutment, lining up its crosswire to a horizontal mark on the eastern side, then loading one span with nine wagons - totalling 144 tons - and reading off the deflection from a graduated staff. Measurements were taken at 10-foot intervals across the structure and compared with theoretical figures, the largest deviation proving to be just 0.13 inches. Simmons’ hand had been forced, leaving him with little alternative but to authorise the line’s opening. In doing so, he restated his disagreement with many of Fowler’s observations and, as a parting shot, insisted that the depth of ballast over the viaduct must not exceed two inches in order to minimise its loading. All this proved a momentary distraction for Simmons. Three years later, whilst on leave in Turkey, the British Ambassador requested that he report on the country’s ability to resist a Russian advance. Then the Crimean War started. In 1854, he became British Commissioner with the Turkish Army, playing a prominent role in several battles. His distinguished military career culminated in promotion to field marshal in 1890. The viaduct's Pratt truss dominates the scene at the footpath's opening ceremony. An evolution had changed the face of Torksey Viaduct by the turn of the 20th century. In 1877, the timber approach structure was replaced by cast iron screw piles supporting wrought iron girders whilst, 20 years later, the main spans were stiffened by moving the southern girder outwards to create space between the tracks for a pair of Pratt trusses. How telling is that? A train last tested Fowler’s work in 1959. Closure brought deterioration with it and, despite a Grade II* listing, the structure recently found itself on the Heritage at Risk Register. 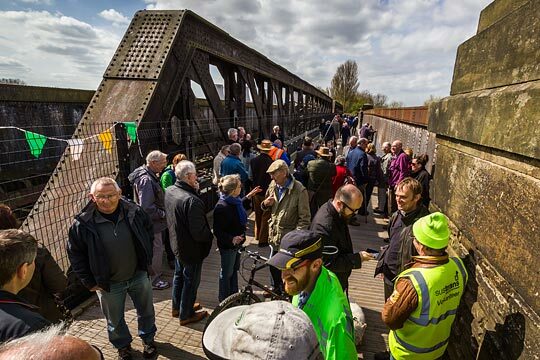 However two £200,000 grants from the Railway Heritage Trust paid for Hankinson Group to grit-blast and repaint the north-side ironwork in advance of a footpath being laid over it by Railway Paths, the viaduct’s current custodian, and Sustrans. This was formally opened in April 2016. Further afield, Britannia Bridge was damaged beyond repair on the evening of 23th May 1970 when two boys - playing inside it - dropped a burning torch and set alight the tar-coated timber roof. It was rebuilt to an arched design by Husband & Company, later acquired by Mott MacDonald. Rail traffic resumed in January 1972. Stephenson’s other tubular girder bridge over the River Conwy continues to carry trains on the North Wales coast line. Regulators have a duty to challenge innovators, but don’t have the right to stifle them. When it came to box girders, officialdom was overcome by the great Victorian engineers who wielded considerable clout; too much of it perhaps. Today the tables are turned, driven by an institutional fear of the unknown. 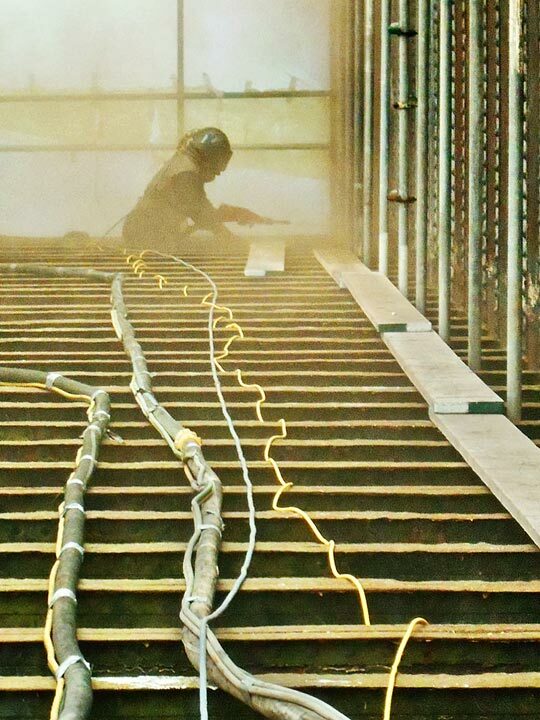 The extent to which that disadvantages the industry as it strives to reduce costs and improve efficiency is something that should be determined. Did Hodgkinson have a formula for that? Forgotten Relics' video about the opening ceremony. A news story about the footpath's opening.